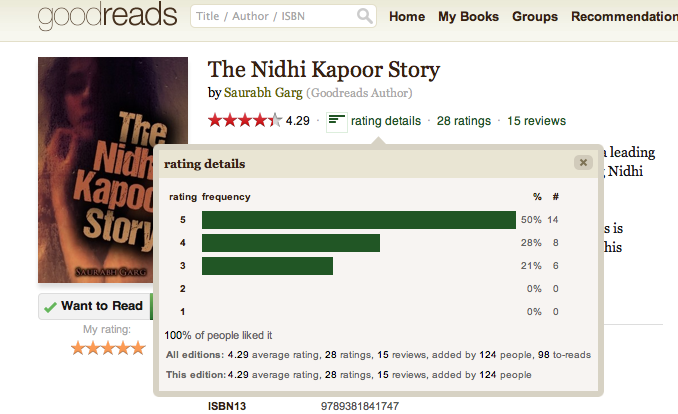 Buy The Nidhi Kapoor Story! #tnks is now available online and at bookstores near you! Right now, shipping is limited to India only. If you live out of India and you want to read #tnks, please contact me. I would be happy to figure out a way. Before you make the buy decision, please read this letter that I wrote BEFORE the book went to print. I am glad to have lived upto the expectations. For your benefit, here are a couple of pieces of feedback that I’ve received on the book. …this is the most well-crafted story of the contemporary times. The mystery is huge, yet palatable, the thrill is unvarying and consistent, the plot line is well thought-out. There have been so many points to admire about this book, I am compelled to enumerate them, so not to leave out any. If you need more convincing, a longer list of reviews (good and bad) is on the reviews page. For the benefit of lazy ones, here are the buy links again. And if you do buy it, please tell me what you think of the story. After all feedback from patrons is THE thing that would make me a better writer.